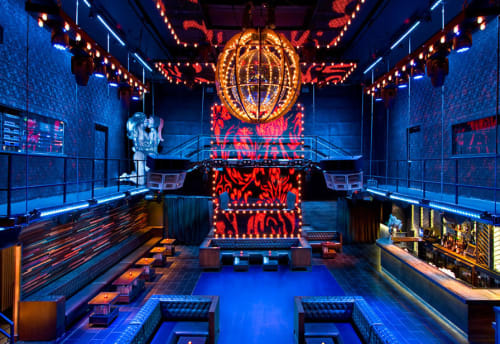 Marquee is an internationally acclaimed music destination, attracting the most in-demand DJs and live acts. This legendary Chelsea nightclub defined a generation of New York nightlife. The modern and sophisticated space is also more than just a nightclub. Marquee is a versatile, music-centric venue that can accommodate all your event needs. The venue’s key features include three full service bars, kitchen prep area, state of the art sound & lighting, perfect for both DJs and live music and a Green Room for talent production. Marquee is the ideal venue for your next corporate function, private party or concert. I`ve walked by this location time after time, but little that I know that it was an amazing event space inside. What a night! Great vibe. Hope to get the chance to go for an event again! It was my first time coming to this club. I came here with my friends on halloween for A Night of Carnage. This place went all out for Halloween and the music was sick. I had a really good time and I&#x27;m definitely coming back again.